This morning I went for a walk with the boys, and was less than impressed, today is Rubbish Collection day, of which we are very lucky and have two every week, the only down side is that your bags of rubbish have to be roadside by 6am, and if you are going to be considerate then you don't put them out the night before. 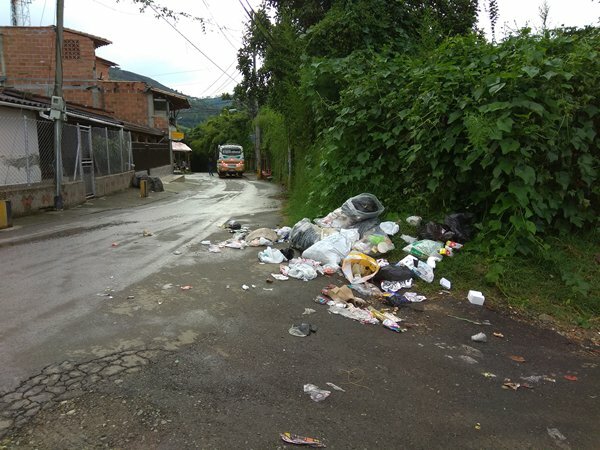 However there are some areas the wagon can't reach, so people have to come down to a central point and leave their rubbish, there is no cage or container, the bags are just stacked at the side of the road. A dog's Picnic! I give the Binmen credit for trying to clean up`most of it, but they haven't the time to clean it thoroughly, and they shouldn't have to, it is the dog owners fault after all. It is time the Town Hall, took action, either against the dog owners, or deal with the dogs, and bill the owners for doing so. 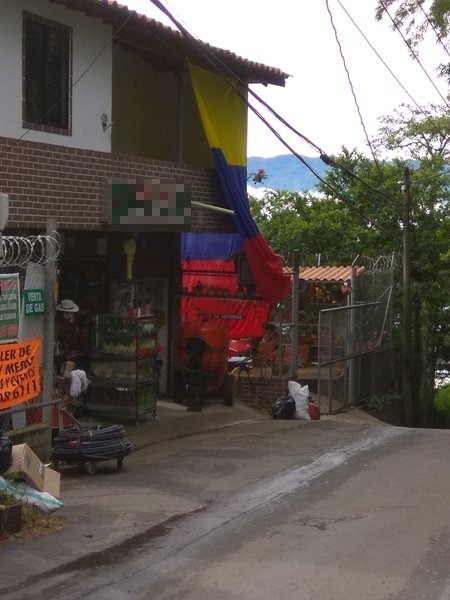 That's number one gripe out of the way, the second, I saw on my return home, the neighbouring business, owned by...yes you guessed it 'Enimigo', has put up a giant Colombian National Flag on two sides of his building, ready for the Football World Cup, but there is not the space for it. So it is left straddling a wire fence. I am all for Patriotism, but at the same time, more importantly, I believe in showing respect and dignity to the National Flag, whatever Country it belongs to, not treating it like an old rag. This man is showing he has money, and can afford a flag of this size, but he hasn't the space to hang it, disgusting! That's number two gripe out of the way, let's hope that's the last one for today, at least, now for some gardening.